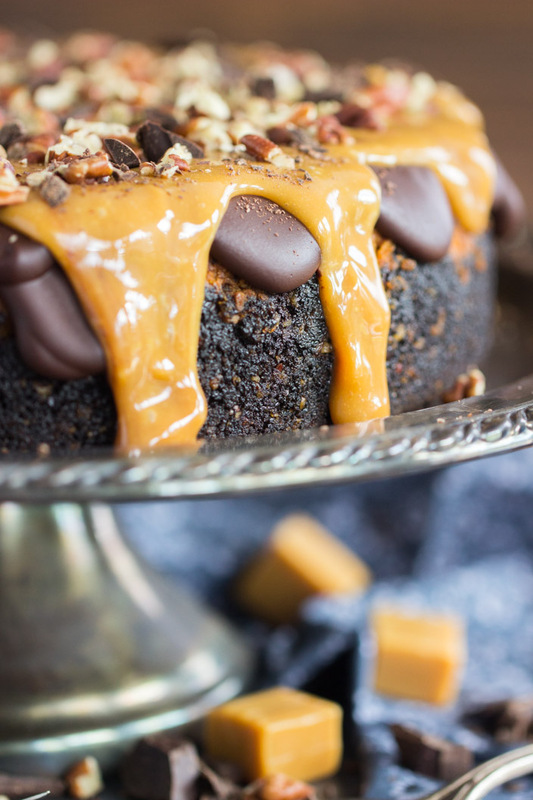 A perfectly spiced pumpkin cheesecake, creamy and rich, drenched with silky chocolate ganache, caramel sauce, and toasted pecans! 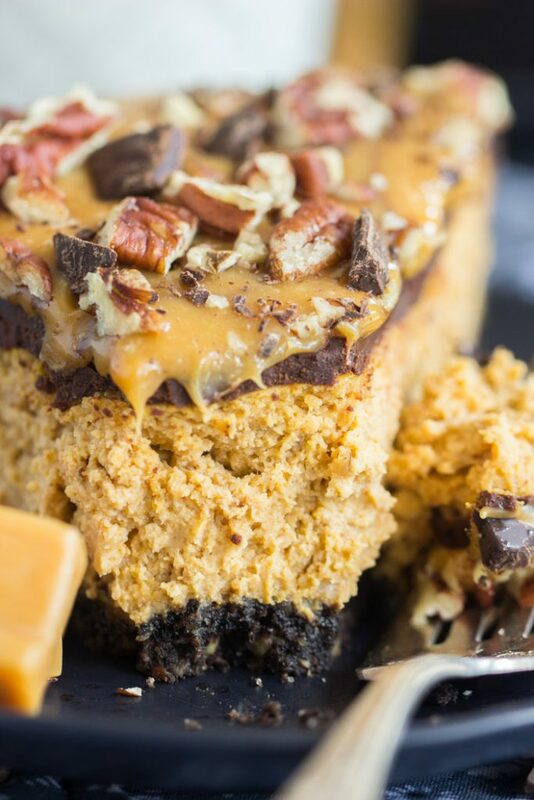 This Turtle Pumpkin Cheesecake takes a traditional pumpkin cheesecake to the next level. You’re going to notice a theme this year. A couple themes. I’m not going to spoil the them all right now, but one theme you’re going to notice is pumpkin cheesecake. I think I made 5 variations on a pumpkin cheesecake, starting with this Turtle Pumpkin Cheesecake. Besides a few different pumpkin cheesecake recipes, I also made several other seasonal cheesecakes too. You’ve been warned, I guess. If you’ve been around here for a while (btw, my blog turned FIVE this month! WHOA. 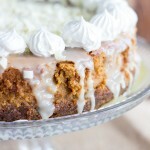 ), you’ll know that pumpkin cheesecake is one of my favorite desserts of all time. 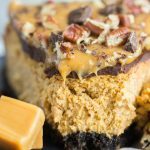 Specifically these two — a traditional Double Layer Pumpkin Cheesecake and this 10-minute Double Layer No Bake Pumpkin Cheesecake. Both are layered cheesecakes, as their names might suggest, but one is a classic baked version, and the other is a quick, simple no-bake. I love them both. 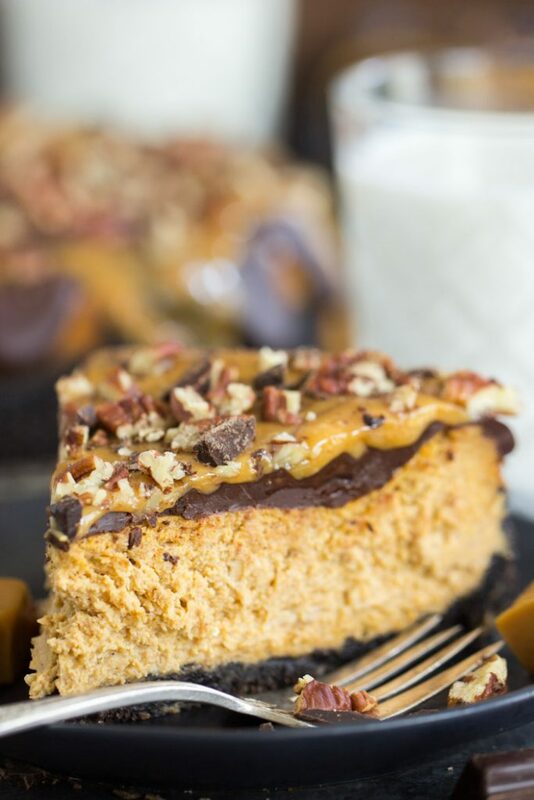 I’ve been making both of those since about 2004, and I credit them not only with igniting a love for pumpkin cheesecake, but also just pumpkin in general. I think this was the same year that I discovered this awesome recipe for Pumpkin Cookies with Brown Butter Icing, and things have snowballed from there. I always love figuring out different ways to put a new spin on an old favorite, and that’s how I landed on this Turtle Pumpkin Cheesecake. 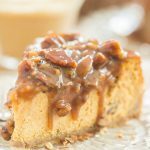 I thought that the trio of chocolate, caramel, and pecans would be a fantastic way to give pizzazz to pumpkin cheesecake. And it is! 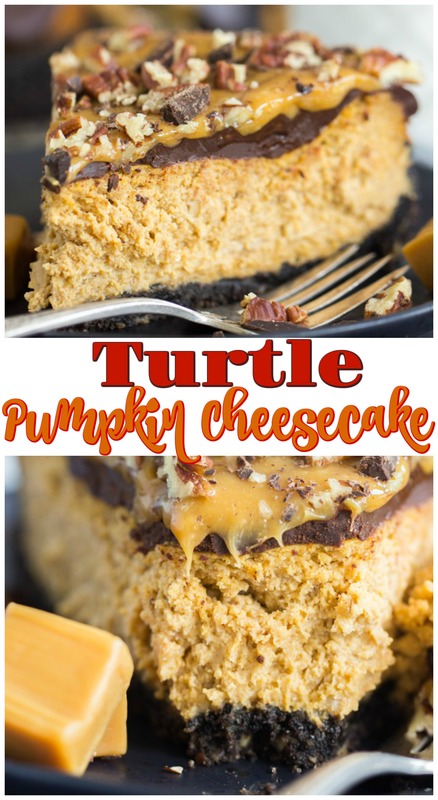 A Turtle Pumpkin Cheesecake was definitely an excellent next step in revamping a standard pumpkin cheesecake. 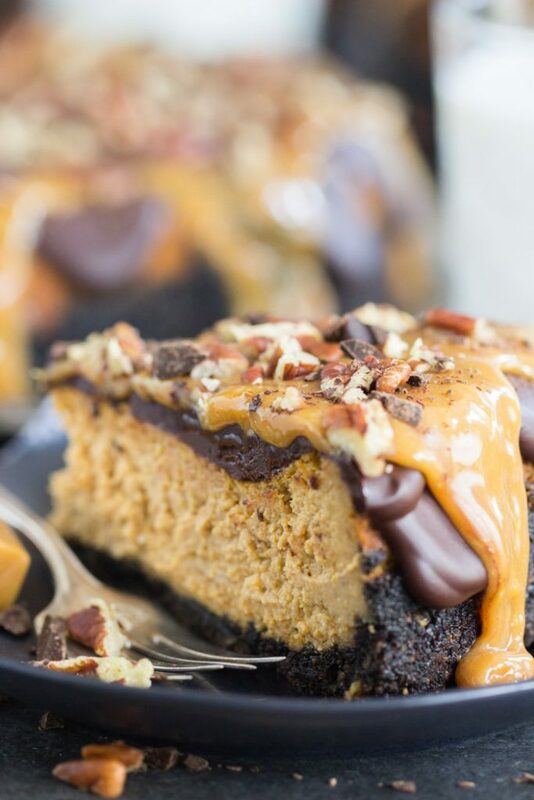 This Turtle Pumpkin Cheesecake starts with an Oreo cookie crust to give it a boost of chocolate at the outset. I also threw in a handful of pecans. 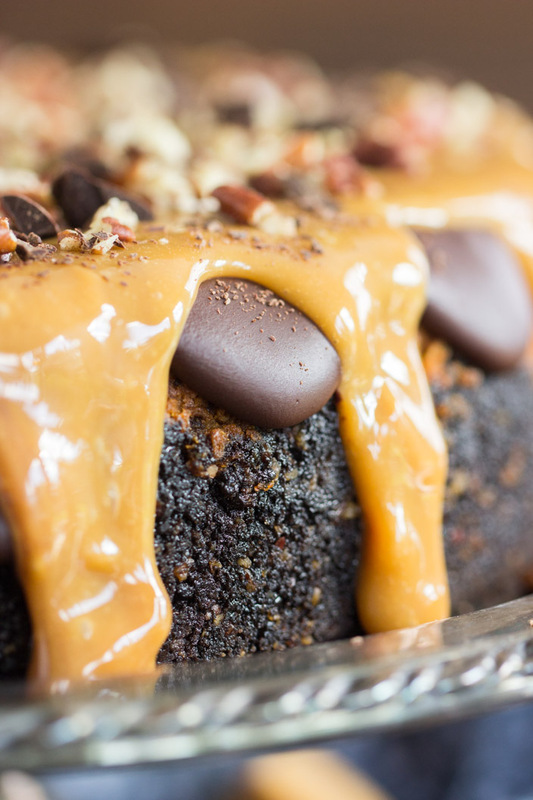 I wanted to incorporate the turtle theme from top to bottom, and a chocolate-pecan crust was a perfect start. 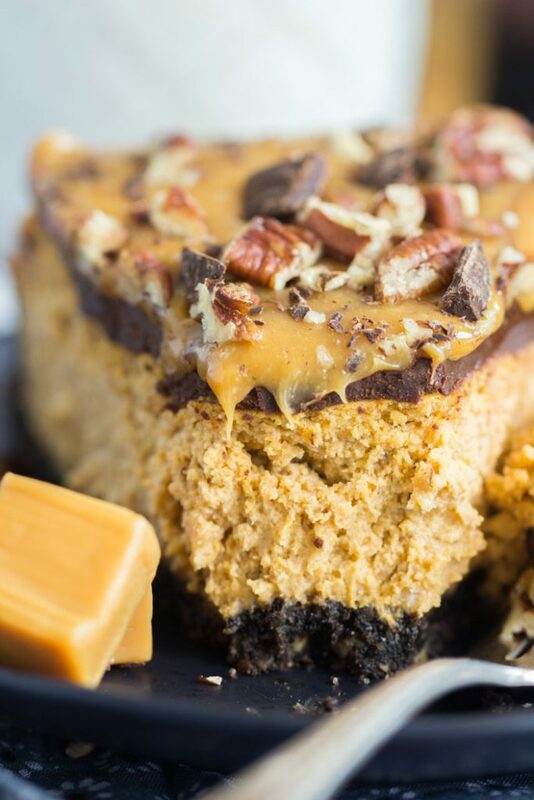 Next up, this Turtle Pumpkin Cheesecake features a cheesecake layer, of course. A classic pumpkin cheesecake, creamy and rich, and perfectly spiced. The same filling that I use for most of my pumpkin cheesecake recipes! To top it off, I drenched this cheesecake in a layer of silky semi-sweet chocolate ganache, a heap of melted caramels, and a scattering of toasted pecans. 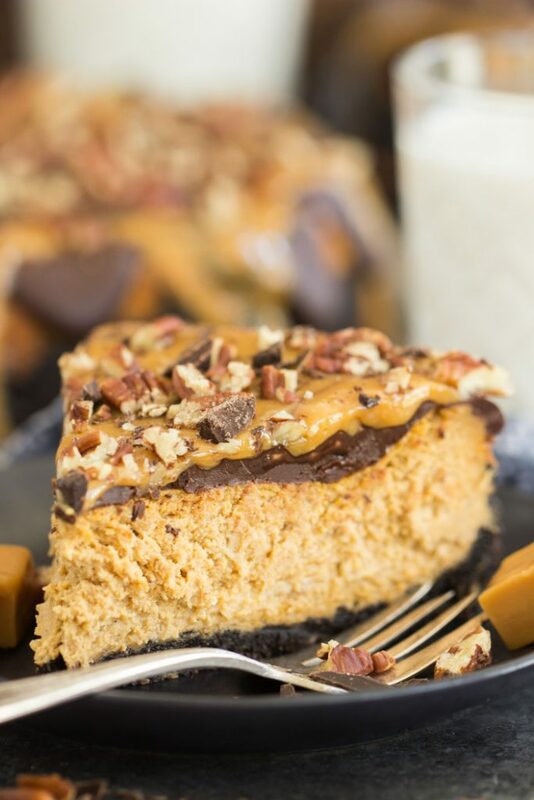 Turtle desserts are already delightful on their own, as is a pumpkin cheesecake, but you’ll be even more blown away by putting the two together in this Turtle Pumpkin Cheesecake! 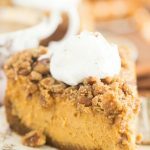 More to come, but here are a few other favorite pumpkin cheesecake recipes: check out this Streusel-Topped Pumpkin Cheesecake, this Apple Crisp Pumpkin Cheesecake, or this White Chocolate Pumpkin Cheesecake with Gingersnap Crust! 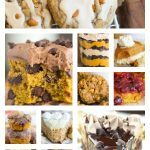 For super quick & easy no-bake pumpkin cheesecake recipes, check out this Double Layer Nutella Pumpkin Cheesecake or this Double Layer Biscoff Pumpkin Cheesecake! In a medium bowl, combine crust ingredients, stirring until thoroughly mixed: Oreo crumbs, sugar, butter, and chopped pecans. Press into the bottom of a greased 9-inch springform pan. I like to press the crumbs slightly up the edges too, about 1 inch. This is just preference. Add sugar, beating until smooth. Add eggs, one at a time, beating well after each addition, and scraping the sides of the bowl after each addition. Beat in extracts, spices, and pumpkin puree, until smooth. Bake at 325 degrees for 75-85 minutes, or until the center is just slightly jiggly. Remove the edges of the springform pan, and carefully transfer cheesecake to a serving platter. 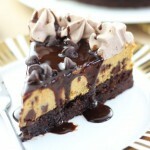 In a small microwave-safe bowl, combine semi-sweet chocolate, heavy whipping cream, and butter. Microwave for 30 seconds, stir, and continue heating at 15-second intervals, stirring in-between, until mixture is melted and smooth. Spread ganache evenly over the cooled cheesecake. Refrigerate for 15 minutes to set the ganache. In a small microwave-safe bowl, combine caramels and heavy whipping cream. Microwave for 1 minute, stir, and continue heating at 30-second intervals, stirring in-between, until mixture is melted and smooth. Cool 2 minutes, then drizzle/spread caramel evenly over the ganache - it will be thick. Try to do as little 'spreading' as possible so that you don't melt and move the ganache. Allow caramel sauce to set, about 15 minutes. Cut and serve. Store in refrigerator. I find Watkins' brand caramel extract at Walmart Neighborhood Markets or Walmart Superstores.